Even though it sounds somewhat different this salad is very refreshing. The taste could be described as both sweet and savoury and I really think you are going to like it. You can even break it down to the three basic ingredients of watermelon, feta and mint and just eat it like that. Serve with some nice sliced toasted rye bread to soak up the delicious juices. Preheat the oven to 180°C. Use a sharp knife to cut the watermelon crossways into 1 inch square thick slices about 1/4 inch thick. Cut each slice into inch wide wedges. Place in a large bowl and set aside until required. Spread walnuts evenly over a baking tray and cook in preheated oven for 5 minutes or until toasted. Remove from oven and set aside to cool. Meanwhile, to make the lemon dressing, use a fork to whisk together the oil, lemon juice and sugar in a small bowl until well combined. Cut the feta in half horizontally. Cut crossways into 1/4 inch thick slices. Add to the watermelon. 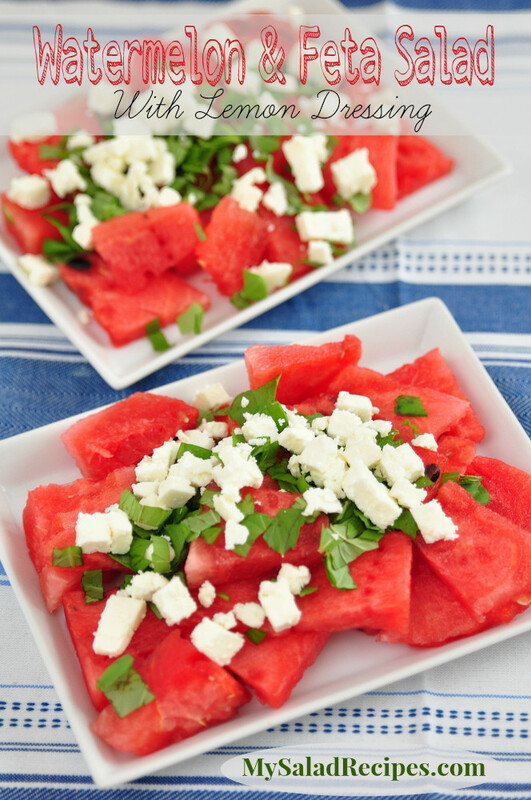 To serve, add the toasted walnuts, parsley, mint and spring onions to the bowl of watermelon and feta. Drizzle with the lemon dressing and gently toss until well coated. Divide the salad evenly among serving plates and serve immediately.